I had some real qualms about posting this event, particularly after promoting the Lauren Katzenstein Celebration Ride where the registration fees go to MADD to support its campaign to make our streets safer. If someone hadn’t asked for information, I wouldn’t have bothered. Here is an email I received second-hand. Dust off your bikes and take a few practice rides around the block. One of West Palm Beaches best days is back. BICYCLE, BICYCLE — I WANT TO RIDE MY BICYCLE!! TOUR DE BAR June 27th NOON TIME at Brass Ring Pub on Northlake. Previous years have had as many as 400 participants and ten pub stops (CHEAP DRINK SPECIALS). If you would like to join the festivities, be at the Brass Ring Pub at 12:00pm. Tardy riders should head South on US 1 to meet up with the hoards of hyper riders. If you are really late, head East on Blue Heron and cross the bridge towards the ocean — we’ll be at the Sailfish Marina.Then it’s time for voodoo buckets at Portofino’s before ending the day at Hilton Singer Island. Let me know if you have any questions. And as always, pass this email onto anyone I may have missed. I had questions and emailed the original sender, but have received no reply. Show up at your own risk. Drink and ride responsibly. Or, use this as a warning to stay out of the area while the Tour de Bar Ride is going on. The Brass Ring Pub is exactly where Google says it is located. The reason they specified the Northlake location is so as not to confuse it with the Brass Ring Pub way out west on Okeechobee. 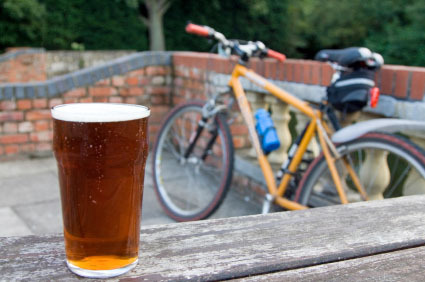 As for safety, I’d much rather someone be drunk on a bicycle than drunk driving a car. Just FYI. They can arrest you for DUI on a bicycle. I’m not so much concerned with the laws of man as the laws of physics. I’d much rather have a drunk cyclist plow into the side of my car than a drunk behind the wheel of an SUV. I once borrowed a beach cruiser that had a beer holder on the handlebars for a half-mile ride to a fest at Bryant Park. Someone there warned me I could get hassled for having an open container of beer and/or be checked for DUI. I did NOT get a visit from the cops before returning the bike. Years ago someone noted there’d been a lot of late-night bike accidents. Turns out the cyclists were folks who’d lost their driving licenses and were on the way home from the bars. I know that because I am conversant with the laws of the state as it concerns vehicular travel. I was once stopped for having flashing white lights on my motorcycle. Did you know they are reserved for tow trucks. There are three colors you can manifest on Florida’s roads. Red for stoplights. White for headlights, and orange for turn signals. The West Palm Beach cops will let you get away with green for accent lights, but the Florida Highway Patrol will not. Your incredibly equipped bicycle conforms. And I have no worries that you’ll be caught riding it drunk. But, golly, if you had a better generator and visited the shop I take my motorcycle to, I would worry. Please, Keefer– don’t give him any ideas!! It’s embarassing enough to ride with him now looking like an alien bumblebee with a beard. Heaven forbid he should glow, too. The aforementioned drunk (shouldn’t it be drunken??) drivers, plowing into him, would beg to be hauled off to jail fearing vaporization or being stung with alien bee juice.